WHAT HAPPENED: It’s been a long wait for Kevin Anderson. One chock full of ups and downs, injuries and setbacks. 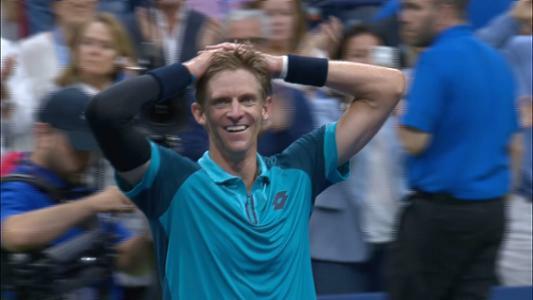 But on Friday evening at the US Open, the 31-year-old South African – having battled his body as much as his opponents in recent years – earned a spot in the first Grand Slam final of his career with a 4-6, 7-5, 6-3, 6-4 upset of No. 12 seed Pablo Carreno Busta. There were the knee, shoulder and groin injuries of 2016, not to mention ankle surgery. He would fall as low as No. 80 in the world this past January, a hip injury leading to pullouts in Brisbane and Melbourne, his first absence from the Australian Open in a decade. His future in the game once in doubt, Anderson now finds himself in the US Open final, awaiting either world No. 1 Rafael Nadal or Juan Martin del Potro. “This means the absolute world to me,” added the 28th seed, the first South African to reach the U.S. Championships/US Open final since player-turned-commentator Cliff Drysdale in 1965. Long one of the tour’s biggest servers, Anderson came into the semifinal having been broken on just three occasions in 87 service games. Fittingly, he would christen the match with a booming 120 mph ace, and surrendered just one point through his first three service games of the match. But facing his first test serving at 3-all, 15-40, he flinched. Though he managed to save the first break point, he could not save the second, as his backhand approach sailed beyond the baseline. Of Anderson's 43 errors, 14 would come in the 33-minute opening set alone, as oft-clay-minded Carreno Busta lured the South African into extended baseline rallies. After an early exchange of breaks in the fourth and fifth games of the second set, it was Carreno Busta who would find himself under pressure serving at 5-6, 30-40. Anderson pounced on his opportunity, leveling the match at one set apiece by burying a backhand approach into the corner. It marked the first set of the fortnight dropped by Carreno Busta, at 26 the youngest Spaniard ranked inside the Top 100 (No. 19). Carreno Busta nullified a triple break-point opportunity for his opponent for 1-all in the third set, but he would offer up an untimely double fault at 1-2, 15-40, as Anderson moved ahead. 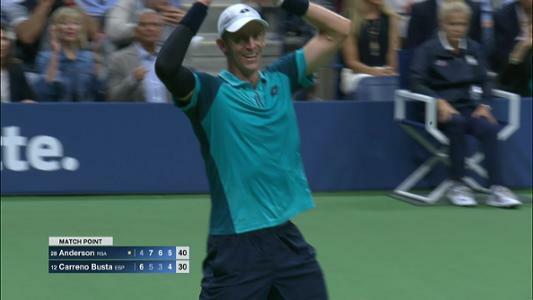 The baseliner saved a pair of set points at 2-5, but Anderson soon stepped up to grab the set and a commanding two-sets-to-one lead, the exclamation point his 20th ace of the match – a 132 mph blast. Carreno Busta was in unfamiliar territory, and it showed. He had yet to play from behind though his first five matches, and clearly seemed out of sorts early in the fourth and final set. At one point, the Barcelonan booted a ball soccer-style into the crowd in frustration. Anderson would soon distance himself for good with a clutch break at 2-all, and later stepped up to serve out the match in two hours and 54 minutes. Playing the 34th major of his career, he was finally into his first major final. You’ll forgive the former University of Illinois standout, who outpaced his opponent in aces (22-1) and winners (58-21), if he broke protocol after the match, celebrating his semifinal win by climbing into the Friends Box to celebrate with his team, a tradition usually reserved for the year-end Slam’s champion. When you wait this long to reach a Grand Slam final, you make the most of the opportunity. WHAT IT MEANS: At No. 32, Anderson becomes the lowest-ranked Grand Slam finalist since No. 38 Jo-Wilfried Tsonga at the 2008 Australian Open. Regardless of whom he faces in the winner-take-all finale, he has never defeated either opponent. Anderson is 0-6 vs. del Potro and 0-4 vs. Nadal. MATCH POINT: Who would be the more favorable matchup for Anderson in the US Open final: Rafael Nadal or Juan Martin del Potro?